We are so privileged in Johannesburg to have access on our doorsteps to world-class productions (quite literally). If an air-ticket to London is out of the question (let alone R600 odd for a theatre ticket) then make sure to see the current productions of London’s Royal National Theatre which are broadcast live and screened at Cinema Nouveau in Rosebank. Helen Mirren’s performance in The Audience was riveting and I was gripped throughout the entire 3 hours of Nicholas Hytner’s production of Othello. 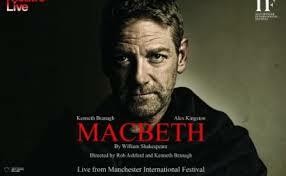 Macbeth (with Kenneth Branagh directing and taking the lead role) comes up on the 2nd, 3rd, 6th and 7th November and next year March, we’ll be able to see Tim Hiddleston as Coriolanus. The contemporary settings and the consummate acting make these renderings both as accessible (in the sense of intelligible) and as relevant as they were in Shakespeare’s day. There will be live screenings worldwide of the brilliant production War Horse from end February but no indication yet of whether South Africa will be included in these screenings. So hold fingers and thumbs and every digit you have, that we don’t miss out. 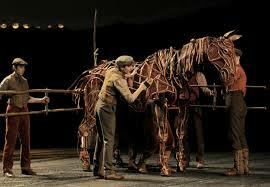 The giant War Horse puppets were made by our very own South African Handspring Puppet Company. And of course don’t forget the films of block-buster international art exhibitions such as Vermeer and Music at the National Gallery, London showing on 26th, 27th 30th and 31st October. Manet’s Portraying Life at the National Portrait Gallery London and the Munch exhibition in Oslo, (screenings come and gone), like the Vermeer, take the viewer around the exhibitions giving fascinating insights into not only the artists’ life and work, but also into the curatorial process of putting the exhibitions together. And as if all this is not enough to leave us culturally satiated, the newest season of live opera from the Met opens on 9th November with Tchaikovsky’s Eugene Onegin. These screenings usually only run for a week, two weeks at the very most so if you blink you miss them. And again our South African artists have made their mark internationally – see Kentridge’s brilliant production of Shostakovich’s The Nose (starting 30th November). Remember his extraordinary rendering of The Magic Flute? The rest of the Met opera season includes screenings of Tosca from 7 Dec; Verdi’s Falstaff opening 8 Jan; Dvořák’s Rusalka, from 8 March; Borodin’s Prince Igor starting 29th March; Werther by Massanet – from 5th April; La Boheme, 26th April; Cosi Fan Tute on 24 May and finally Rossini’s La Cenerentola opening on 7 June. Seats can be booked on-line on www.cinemanouveau.co.za or on Ticketline 082 16789. Thanks for the feedback. Please subscribe and then you’ll get automatic notifications of new posts. http://Www.lizatlancaster.co.za/blog and then use the subscribe tab at the right. what a lovely surprise to find your blog by chance, I look forward to receiving more news.